American Barrel Exchange is a website where people from the distilling and brewing industries can sell and buy stuff. I had an interesting talk with Dan, one of ABE’s founders about his organization. Time to find out more? Yes, it is! So … who are you and how did you get into the brewing and distilling business? My name is Dan Brock and my cousin is Steve Pariso. Our family has nearly 400 years of history that involves spirits at some capacity. From using Rum to purchase land and found (develop) New Jersey in the 1600s to moonshiners that were contracted by the government. What’s your professional background, Dan and Steve? We are distillers and brewers. I was a brewer and chef at one of the first Florida brewpubs. Together, Steve and I wanted to create a whiskey distillery: and we are still in the process of persuing that dream. Is that where you got the idea for American Barrel Exchange from? As we looked for equipment, we found it very frustrating that there was no place that everyone could buy or sell new or used equipment. Also, we were annoyed by the steep prices that the big auction sites were charging. Steve, my cousin, was on the teams at Netscape, AOL, CompuServe, and others. Finally, after enough frustration, we sat down and started planning the American Barrel Exchange — barrelbid.com — with a goal of bringing everyone in the industry together on a site that will hopefully become self sustainable. So, from the fees that are only charged to sellers, we use them to support servers, maintenance, moderation, tech support, promotion, and future development. The more people that we have selling, auctioning, or buying, the better the site and more valuable the site is as a resource. We really feel, that by bringing everyone together, we can help everyone — including ourselves — find great equipment, supplies, and services to advance our craft. 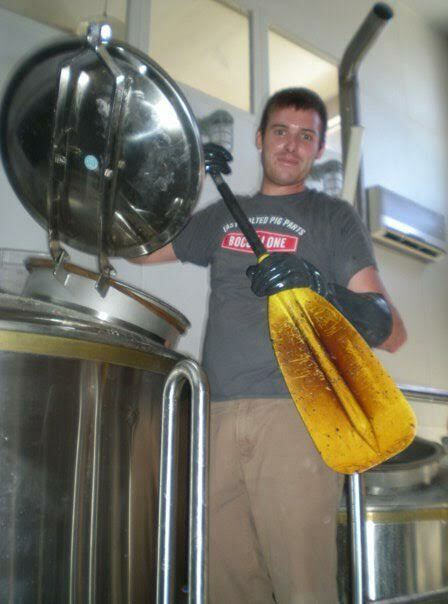 Dan Brock brewing some beer!